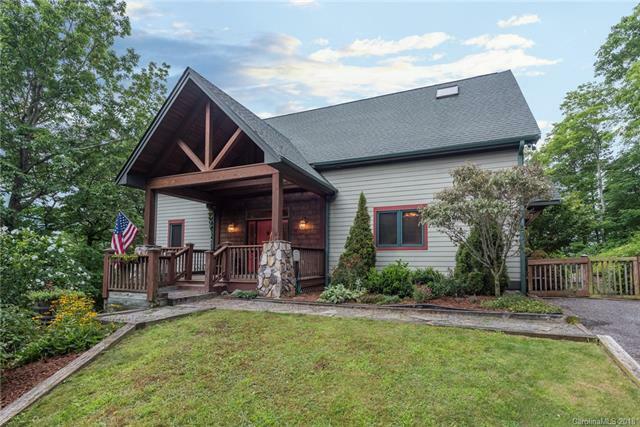 Beautiful mountain home in a private, natural setting only 6.8 miles to downtown Black Mtn and 14 miles to Asheville! Views of 5000+ ft peaks and Lake Burnett (Asheville Reservoir). The driveway is gentle and there is plenty of flat parking for guests. The yard is flat and usable, offering room to run and play! This home is just the right distance from town and is a perfect option for AirBnB or vacation rental. Neighbors are nearby but not visible. Enjoy the convenience of Black Mtn amenities (but without city taxes) in a true mountain setting that feels worlds away. This home has all the features of a storybook mountain retreat - stone fireplace, wood floors and tongue-and-groove vaulted ceiling, generous kitchen, large covered deck, and abundant wildlife out your door. Laurel Ridge is gated community surrounded by conservation land. All roads are paved. Community water system & fire substation (lower insurance premiums). Successful VRBO rental history. Furnishings negotiable.